Mischief Theatre’s raucous The Comedy About A Bank Robbery will be stealing London theatregoers’ breath away for some time to come, with the news that it’s extending its run at the Criterion Theatre until November 2018. And, as with any good getaway crew, there’ll be some new faces joining the company of the hilarious heist hit. From 29 November 2017, current understudies Samuel Fogell and Holly Sumpton will portray jailbird lovebirds Sam Monaghan and Caprice Freeboys, while Officers Cooper and Shuck will be played by newcomer Laurence Pears and familiar face Jeremy Lloyd, reprising his role from the original cast. Original The Comedy About A Bank Robbery cast member Chris Leask will return to the part of Everyone Else, and the cast will be completed by understudies Jack Whittle and Lydia Fraser. The news is yet another cause for celebration for Mischief Theatre, the creative geniuses behind Bank Robbery and The Play That Goes Wrong. They will soon be the only company to have three concurrent shows running in the West End, as they are due to open their new comedy Mischief Movie Night, the hour-long improvised movie live on stage, on 13 December. 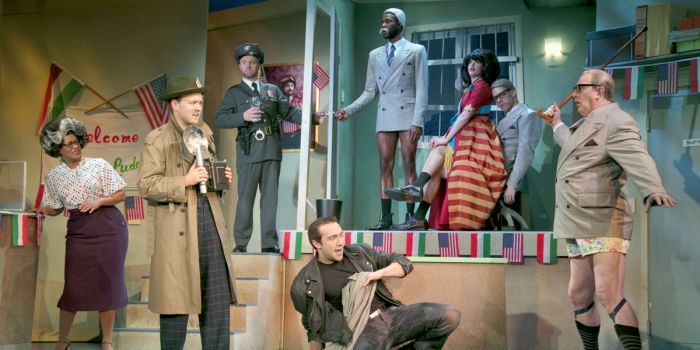 The Comedy About A Bank Robbery is a fast, fabulous comedy caper. Set in 1958 Minneapolis, the City Bank has been entrusted with a priceless diamond. An escaped convict is dead set on pocketing the gem with the help of his screwball sidekick, trickster girlfriend… and the maintenance man. But in a town where everyone’s a crook, who will end up bagging the jewel? The show is now booking until 4 November 2018. Book your The Comedy About A Bank Robbery tickets.